"At the church one often saw her prostrated before the crucifix, sometimes with hands joined, face and eyes uplifted towards the Christ or the Holy Virgin." 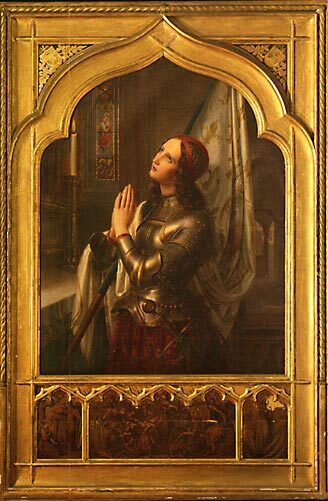 "During the week of last Easter, on the fosses of Melun, I was told by my Voices, that is to say, Saint Catherine and Saint Margaret, that I would be captured before St. John’s Day, and that it was necessary that this should happen, and that I must not be astonished and must accept it willingly, and that God would aid me." I am comforted by the thought that Joan received this news with the message of Easter burning in her heart and soul of ultimate victory in Christ remembering that HE IS RISEN!! !